The Health Informatics Training System (HITS) is an innovative training course designed for professionals new to the field of healthcare IT. HITS provides learners with a comprehensive overview of the fundamental uses of IT in healthcare today. It is a resource for acquiring a clear understanding of health informatics and its contribution to administrative and clinical best practice. It provides the learner with an entry-level foundation that covers the basics of IT in healthcare and serves as excellent preparation for subsequent system-specific training. Learners receive a certificate upon successful completion of the exam. Note: This item has been optimized for viewing in Windows on Internet Explorer. 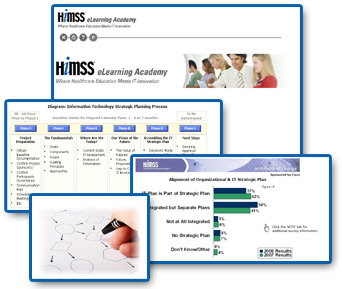 This item is available in the new HIMSS Learning Center. It is no longer available for purchase on this site, and will only be accessible through June 29, 2015. Please contact customer service with questions.